Paul Verryn, during the dark days of Apartheid in South Africa he was the only white minister living in Soweto. In his home he offered sanctuary to boys detained and tortured by the South African police. Subsequently, Paul has traveled with us on several of our Tree of Life journeys and has spoken at our conferences. He has helped us to see that the word “Apartheid” is an appropriate word for the cruel reality of checkpoints, detentions, house demolitions and the asymmetrical use of violence. 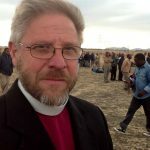 In his ministry at Central Methodist Mission in Johannesburg, Paul welcomed over 2000 refugees from Zimbawe and so taught the world the true meaning of the words “radical hospitality”, the very antithesis of apartheid.